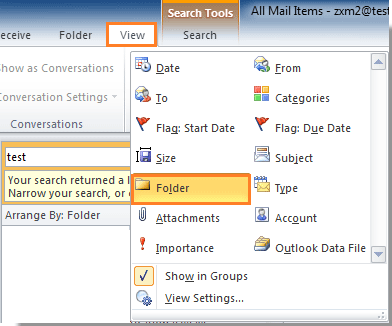 How to show folders in search results in Outlook? By default, when you enable the search function in Outlook emails, the search results will be listed and sorted by date. If you search for All Mail Items, obviously you have no idea of which folders the search results are locating in at a glance. 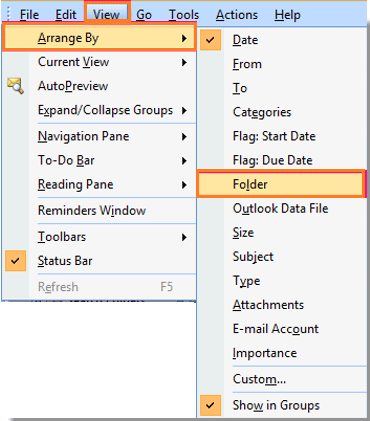 You need to put your cursor on the email and find the folder in the email screen tip, just like the below screenshot shows. Actually, there is an easily way for you to directly show folders in search results. Please follow the following tutorial. 1. Enable the Search, after all the search results are listed in the Mail list pane, go to the View tab. 2. In the View tab, click the button to expand the Arrangement box. 3. Then select Folder in the Arrangement box. 4. Then the email search results are sorted by folder immediately. As the below screenshot shows, some email search results are locating in a folder named “Important”. 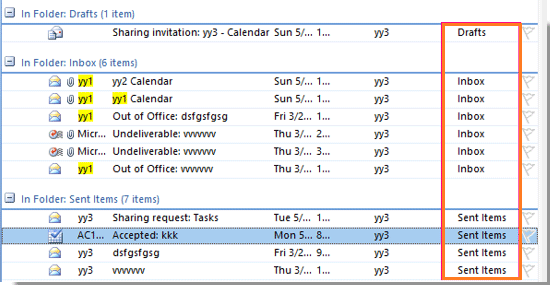 If you are using Outlook 2007, you can also classify the filtered emails by folder as you want. 1. Search for your desired messages firstly. 3. And your filtered messages have been arranged by folder as following screenshot shown. You can easily see which folder the emails are locating. If you show only the folder without the tree, how can you locate the document if you have two like-named subfolders? For example, multiple customers' folders, with similar sub-folders: Acme - Contracts and Burton Co. - Contracts. Can we show trees in search results so that we can find the correct emails?